God has blessed Jeremiah and I with teaching opportunnities in local schools while we are prayerfully planning to start our own. In our last blog Jeremiah talked about where he was teaching and some of our goals. 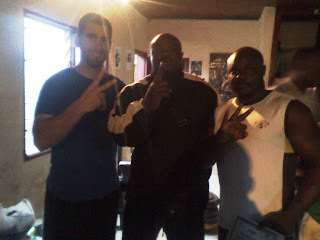 Now I am going to share with you a little bit about Afro American School where I have been teaching. I have an hour to teach a Bible class with them on Wednesday and Thursday. Just like Bible Club I read Bible stories, teach them songs, play games and have fun arts and crafts for them to do. The teachers circulated and made fun of the pictures the kids drew- mocking is a common method of "teaching" in Cameroon. Rather than correcting the teachers I encouraged the kids as I told them their pictures looked great and all you have to do is try your best. Often an example speaks louder than words. What's your favorite animal God created? Hannah's is the giraffe! I home school Hannah and Jonathan so it is especially nice for them to be able to be with other children during this time. On Fridays I help coach P.E. :) On Tuesdays and Fridays Hannah goes to French class at the same school. Jonathan and I sit in on the class and pick up some basic French too. I am so thankful that the head mistress said yes to my offer to teach a Bible class at her school. I know that as we spend valuable time planting seeds God will cause growth. I'm opposed to hand outs- giving something that at best solves only a temporary problem and creates dependency. Our aim to help provide a hand up- to lift people up on their feet and help them have the skills and abilities to accomplish great things without having to rely on us... we want to make ourselves redundant. This is why our primary goal here in Cameroon is to start a unique school which will be a center of excellence in its Spiritual focus, character development and academic quality. Many have started Bible schools, but these often result in a hireling class of preachers, and face immense challenges of trying to teach someone to decipher scripture when they can't tell you the difference between a verb and a noun. We envisage a school that will provide not only a high caliber academic education, but at the same time will turn out students with great Bible knowledge and understanding who also have the character it takes to get the gospel out. This process is going to take considerable finances, time and personnel, and may be some years in the making. As we continue to make preparations for this, raise finances, and also wait upon the Lord to provide teachers, curriculum, approval and more, we both love to teach. SO, I have started volunteering at a local Secondary School, Baird Memorial "College" where I teach remedial English classes twice a week and do the chapel services on Fridays. While the impact of this may be minor compared to when we start our school, it is a place to start, and so we have. Brittney also started teaching in a primary school around the bend, but more about that from her later. The kids I teach are supposed to be in 6th to 8th grade, but I have found their English level to be around 2nd and 3rd grade. They were marched through the programs whether or not they actually comprehended what they were taught and so have massive gaps in their learning- such as knowing that a sentence ends with punctuation. I was given around 20-25 students who were identified as struggling with their English this represents a good portion of those in Form 1 as well as many in Form 2. (Form 1= 6th or 7th grade, Form 2= 7th or 8th: the system varies from that of the United States). I give them photocopies from a 2nd grade book to work on. It is sometimes overwhelming to see how much needs to be done, the gaps in their learning. I am only given 2 hours a week, and know that I won't be able to make up for years of poor learning, but hopefully I can help them make at least some progress and see them improve. This experience has re-affirmed the need for a true Christian school which will excel. It will be a big challenge, but will be worth it. There is only so much Brittney and I can do, but if we can train up young people from a tender age and help them have the skills, abilities, character and the Spirit to make an impact in Cameroon and all of Africa, then we'll see real change. Brittney Takem the day after she was born. The 2 younger Takem kids spent a night with us so Rosette could rest so we made... COOKIES! The finished product turned out great and we took them to the hospital the next day to share with the other mommies. Please join us in prayer for the Takem family to continue to be faithful with our Bible studies and for the health of baby Brittney and mommy Rosette. Also pray that God will continue to give us opportunities like this to show the love of Christ to others. Heave Ho, Heave Ho! It's Off to A Powerlifting Contest I Go! We have been able to have spiritual discussions, make contacts, benefit the community, maintain our fitness, and pursue a hobby all at once through our gym ministry. 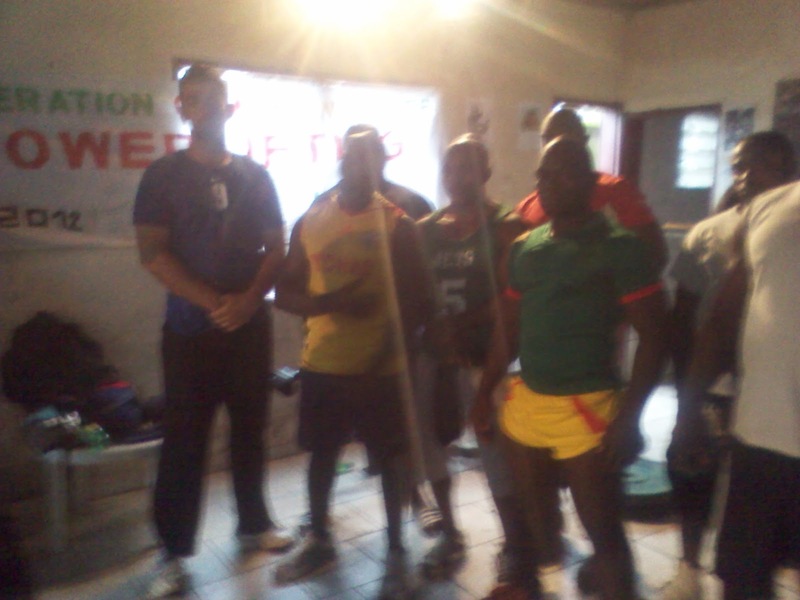 This morning I had 11 guys in the gym for training- some Francophone, some Anglophone, students and teachers, traders, policemen. Brittney has also had a number of ladies training, especially since we changed our times to 6-8 am for the guys and 5:15-6:30 pm for the ladies. 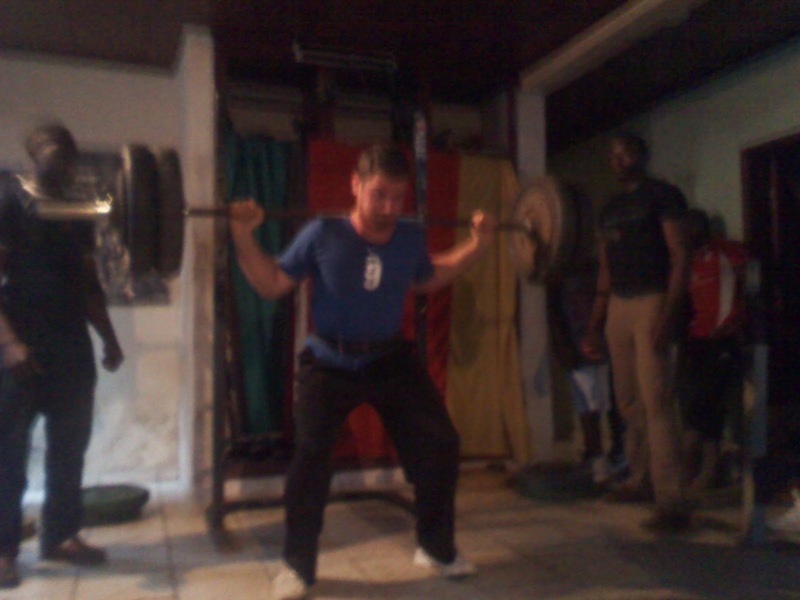 On Saturday, I was able to take part in the Southwest Regional Powerlifting Competition. It was a good chance for me to meet others who are interested in strength training, do some "advertising" for our gym, and also have some fun. The contest started around 1:30 (close to the announced time of 12:00). There were 11 contestants. 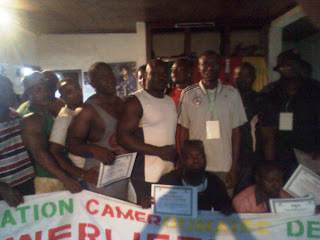 When I saw the size of some of the guys there, my only aim was to finish above last place. I was there for the contacts and to give some exposure to our gym, but the competitive streak in me didn't want to end up in last place. (Sorry for the fuzzy pictures- I used my phone). We had three events- Squat, Bench Press, and Deadlift. In each we were allowed three attempts. 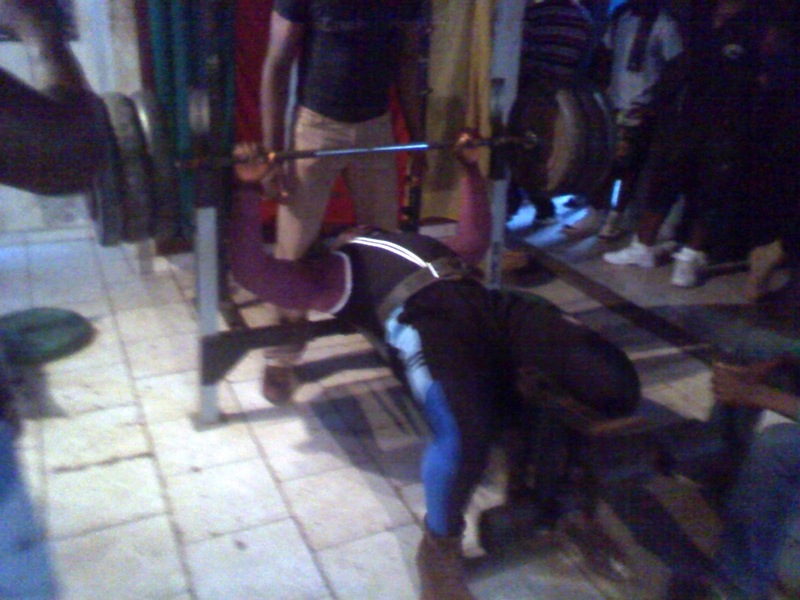 The first event was Squat, my weakest event. 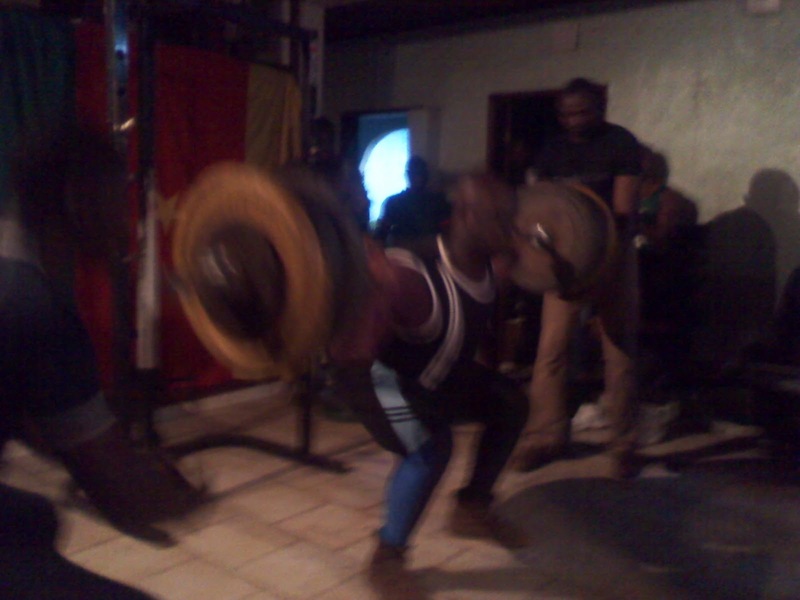 I watched as some of the guys lifted 400+ pounds, to my 300.When the next event, Bench Press, came around, I felt I would do a bit better, and was glad to get 308 pounds to equal my personal best. One of the guys came out with an opening weight a little too heavy for him. He missed it his first and second tries. I pulled him over and gave him some advice- "Tighten up your back, plant your feet firmly on the ground, and EXPLODE!" He went up and--- nailed it! He was pretty happy and I think I made a friend. 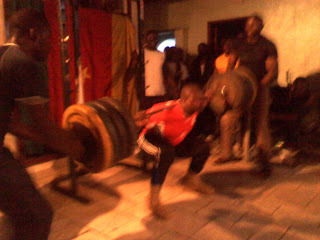 One of the guys was incredibly strong, though he did not do the Squat. He benched 396 pounds! After the two events, I was surprised to realize that I was in the running! 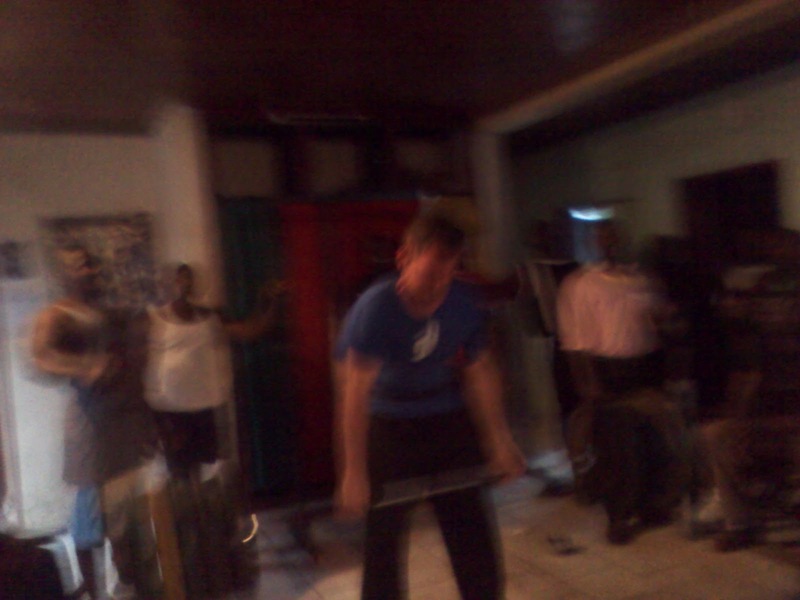 I felt pretty good then about my chances to at least place, as the last event, the deadlift, is my best. 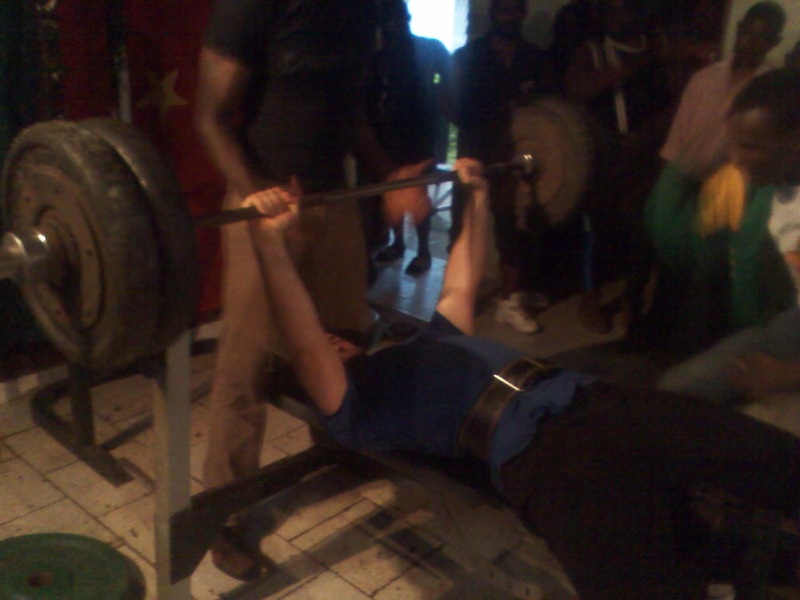 I did 396 easily, 440 also, then my last lift- 484 pounds. As always, I said a quick prayer, and then "addressed the bar." By this time, I had a lot of the spectators cheering me on, as I had surprised them since many of the other guys were bigger and more muscular looking than me. I puuulllleeeed, got the weight up, felt my grip slipping, held on and placed the bar back down- DONE! I was pretty happy to set a new personal best. One of my gym guys, George, a friend of Frederick's and fellow policeman was blown away. In the end, I got 2nd place, a little credibility for our gym, made some friends and contacts, met some other strength athletes, and had a lot of fun! The competition reminded me of an important spiritual lesson- you win such an event, not in the competition hall, but in the training room, when you are doing the long, hard sets, paying the price of the pain, and keeping your focus. If you wait till the competition, you are finished. It's the same thing in life- our end is determined right now. There will be a Great Day one day, and we want to be ready- to be able to say that we fought the good fight, that we finished the race, that we pressed on, that we held on, that we will here our Coach say- well done good and faithful servant! Foods both yummy and... interesting. Cameroon and Ghana have many similarities, in terms of climate, culture, peoples and religion. However, there are some differences, which we must learn and adapt to in order to serve God here. One of those differences is food! We eat Cameroonian food several times each week (today we are eating Kwakoko and Mbanga soup for lunch). Most of it is quite tasty, though some of it... may be an acquired taste which we have yet to acquire (Cameroonian "plums" test the limits of my facial control when I eat them, though Brittney usually manages to smile when we are offered one). Here are a few of the curious culinary creations of Cameroon! Sweet Potato and Tomato Stew- Brittney fixed this. Cameroon has many varieties of potatoes and yams. Traditional Snack of Peanut Paste, Kola Nuts, and a kind of Eggplant. This is served at many meetings and parties especially among people from the Southwest region around Mamfe. Kola is incredibly bitter, but also contains caffeine. The freshly made Peanut Butter is quite good! Kokey (sp?) beans. These are a yellowish bean that is boiled, mashed, spiced and seasoned. Pretty good. Water Fufu. The staple of the Southwest. Made of yam that is soaked in water. It can really range in taste depending on how long it sat in the water... stuff that soaked for several weeks is fermented and foul smelling, but the fresher fufu is tastier. Usually served with Eru, a vegetable a bit like spinach, but also may be served with stew. A meal we made from Ghana- bean stew and tatale (mashed, fried plantain). Yummy! An absolute treat! If you climb above 3000 feet around Buea, there is a chance you will find wild raspberries! They are MARVELOUS! As a missionary, you never know what you will be served to eat, how sanitary it will be, what it will taste like, etc... It is sometimes a challenge, but it really connects to people when you share in a meal, much like when we as the Body of Christ share in the Lord's Supper together. Maybe YOU will come to Cameroon and try some of these and other fascinating foods like my Mom and Dad did! Try it try it, you will like it!